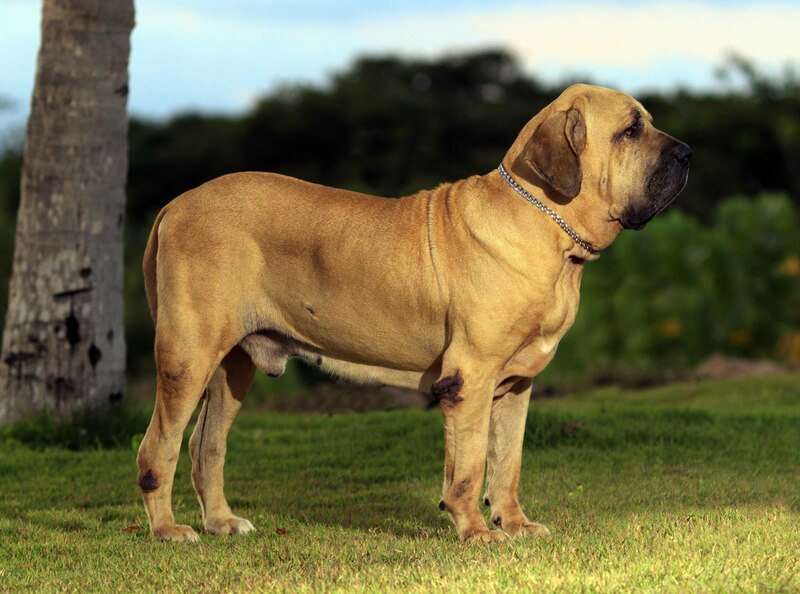 The Fila Brasileiro has loose skin with large bones. 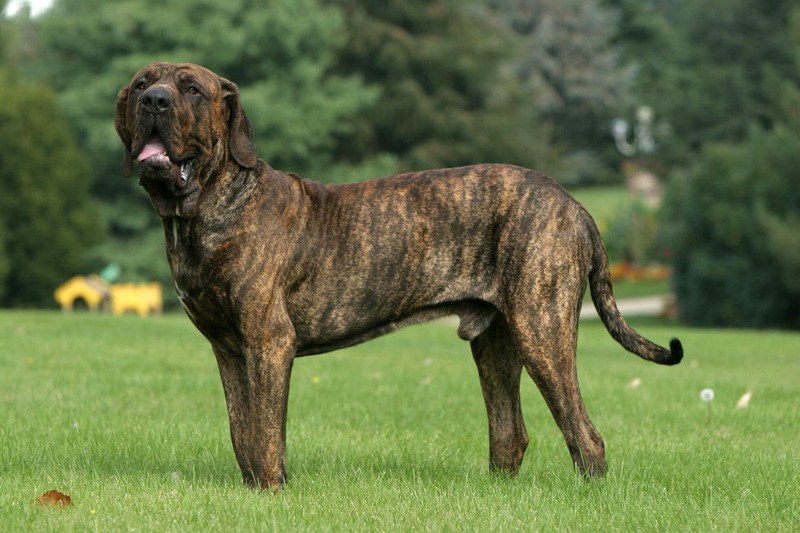 Its body resembles a Mastiff, and the face is unmistakably that of a Bloodhound. It has a black nose with large nostrils, and the large muzzle ends at the heavy upper lip. Its eyes are almond-shaped, wide and set apart. The eye color can vary from chestnut to yellow. The ears are large and V-shaped that are broad from the base and tapered at the end. The gait of the Brasileiro is its distinguishing feature as it resembles that of a camel. It has large feet that point forward and a wide tail that is tapered at the tip. The Fila has a dense coat that may vary in shades of brown, brindle, chestnut, yellow or solid black. There is very less hair around the muzzle or ears. The tail, feet and chest may have white markings. The male Fila stands at 25.5-29.5 inches in height and weighs 110 pounds, whereas the female is smaller in size and measures 23.5-27.5 inches in height and 90 pounds in weight. This breed is an average shedder and may lose hair all year. It is important to brush its coat weekly to get rid of any dead hair and to make sure the oils are distributed evenly. Weekly brushing will keep the coat healthy and looking shiny. Use a soft bristle brush instead of a harsh comb to brush a dog. Bathe the dog when you think it’s time. Bathing depends on how active the Fila is outdoors. Use a vet-approved shampoo to bathe the dog. Do not use a regular shampoo as it will cause its skin to become dry. Check the dog’s ears for infection or wax buildup. Clean its ears gently using a vet-approved cleanser and cotton balls. Do not use cotton swabs to clean the dog’s ear. Make sure to brush its teeth regularly. Regular brushing will prevent tartar and plaque buildup and will keep bad breath away. Trim the dog’s nails if they do not wear down naturally. You can groom the Brasileiro at home or take it to a professional groomer. Filas are instinctively protective of their family. Their caring and watchful nature makes them amazing watchdogs. This breed is extremely affectionate toward its owner and will do anything to please them. However, when it comes to strangers, it is always suspicious and wary. It is completely intolerant when it comes to new friends coming to visit. It will take its time when warming up to people, but when it does, it is highly protective. Owing to its fierce appearance, many people feel uncomfortable leaving it with children. However, this breed is extremely playful and loving with kids. You can be assured that your children will be safe when the dog is with them. This breed is not meant to be kept in apartments. Due to its high levels of energy and size, it remains happiest on farms or large, stately homes. A Fila will protect your house like no other dog, but do not leave it alone for too long as it may result in depression and anxiety. A Fila needs plenty of exercise to burn off its energy. 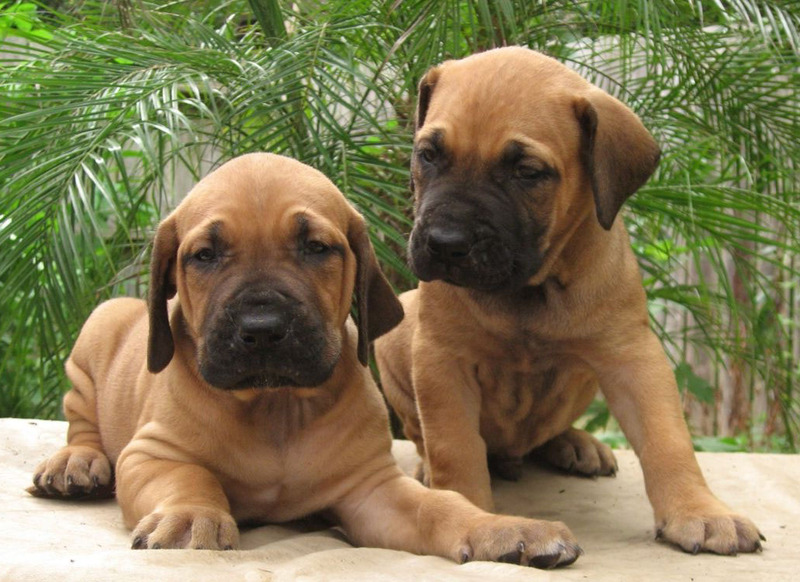 However, it is important to maintain a balance as extensive exercise can cause joint problems in puppies. On the other hand, Filas tend to become lazy as adults and will enjoy lounging and being couch potatoes. This pattern can cause many issues such as obesity. Socialization and training should begin at an early age. This breed has a tendency to become extremely dominant, so it is important to inculcate obedience from when it is a puppy. Filas need a leader that is authoritative and can train them to listen and obey. However, that doesn’t mean you can be severe with them. Always use positive reinforcement when training them. Do not use harsh words or shout at the dog. No matter how much a Fila loves it owner, it will not hesitate to bite if it feels threatened. Training it through treats or other means of appreciation will yield better results. 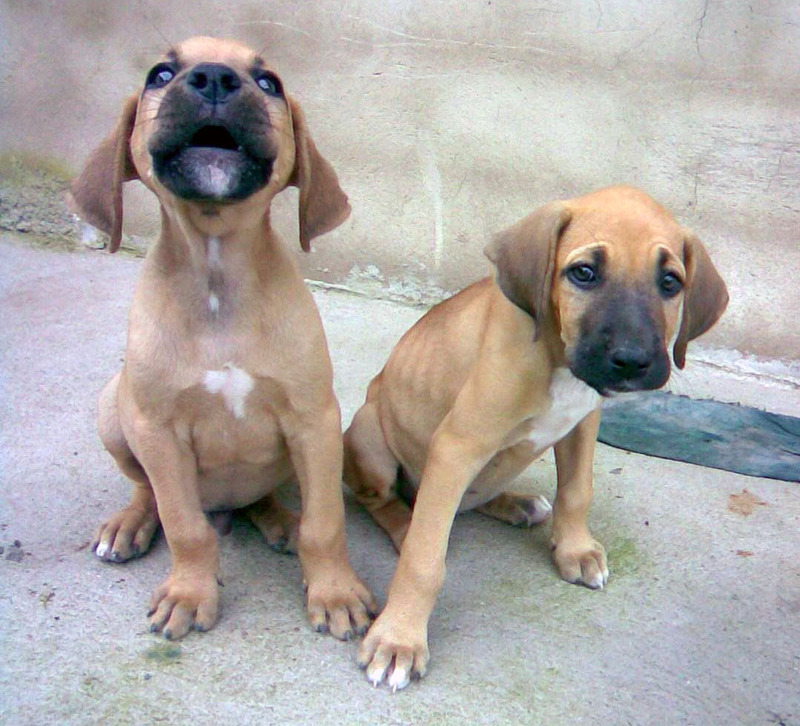 It is widely believed that Filas are a crossbreed between Spanish and Portuguese dogs. They were raised on farms and large plantations and were bred for the purpose of chasing cattle, jaguar and other animals. 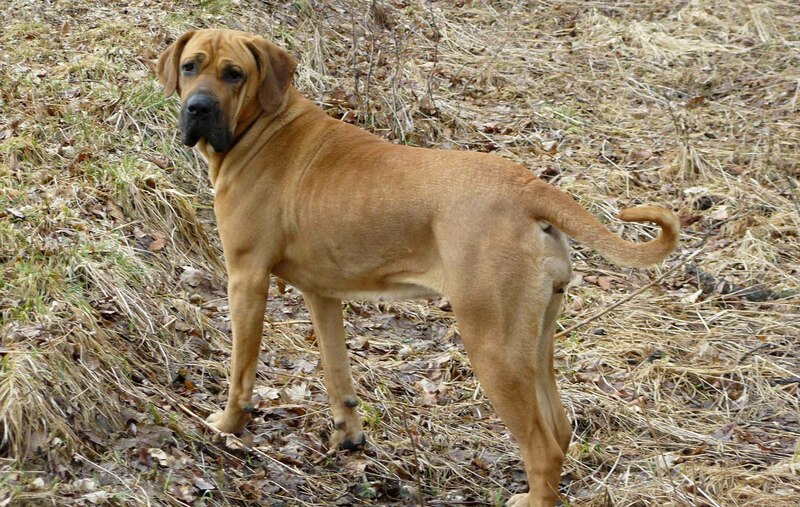 Their intelligence, strength and temperament set them apart from many other breeds.